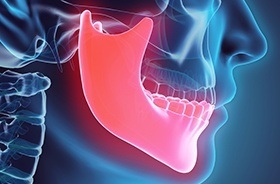 Your temporomandibular joints (also known as the TMJ) are small parts of the body with very big jobs – they connect your lower jaw to your skull, helping you chew food, speak clearly, and even yawn. Unfortunately, this system can be thrown off-balance by strain, dysfunction, or injury, resulting in pain for unlucky patients. At Santavicca Dental Professionals, our team wants to help you regain the oral harmony needed to enjoy your smile to the fullest extent. Dedicated TMJ therapy is available here in Lebanon, NH, so please don’t hesitate to contact us if you are in need of help. When teeth are missing, overcrowded, or have shifted recently, the patient’s biting pressure can spread unevenly throughout the mouth and contribute to TMJ disorder. In order to bring back balance, we can perform an occlusal adjustment (also known as equilibration). 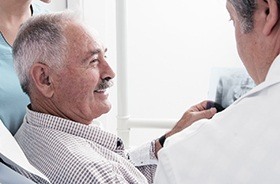 This process will involve the conservative adjustment of certain dental surfaces so that the rows of teeth are able to come together properly, aligning the jaw in the process. An occlusal splint is a custom-made oral appliance that can shift the patient’s jaw towards a more comfortable and healthy position, relieving TMJ-related strain in the facial muscles. 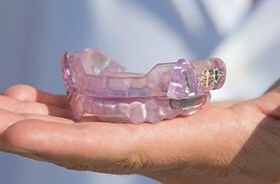 This device can also prevent bruxism to help patients sleep peacefully throughout the night. We will provide detailed instructions for when to use your occlusal splint for the best results possible, and many patients even achieve permanent relief over time!